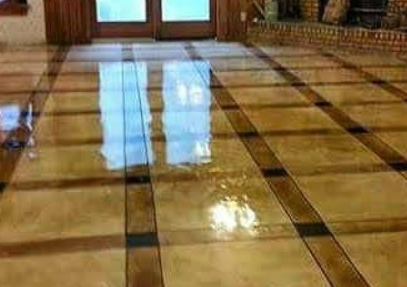 ​One of the options you have available when it comes to concrete finishing is the quality acid stained concrete we deliver to the Richmond area. This allows you to provide a marbled look, to make your concrete surfaces look for rustic, or any other number of potential opportunities. No matter the look you’re aiming for, you can count on your local concrete company to bring you the results you need. We have the artistic and professional touch needed to bring you the best in the city. Choosing acid stained concrete brings you the capability to provide a number of unique looks, giving you the most amount of choice when it comes to your personalization. When looking to Richmond Stamped Concrete for your concrete driveway or flooring, you have the means to choose this finishing measure, and the quality sealing needed to lock in the aesthetic charm. If you’ve looking for concrete contractors who put care and attention into every step while still providing you haste and affordability, you can count on the local area experts that Richmond Stamped Concrete brings to your project needs. After cleaning and prepping the area, we get to work on bringing the acid staining you need for your results. This is a step that requires knowledge and capability to utilize safely and counting on your local concrete company to bring you these services is important. When you have the experienced touch of Richmond Stamped Concrete at work on your property, you can depend on our experts to bring you the means to the perfect application in this step, with a focus on ensuring that the results will be what you’re looking for, while maintaining safety and attention to detail. After the application has taken place, there is a waiting period that must be adhered to in order to allow the acid to do its work. Providing you the cleaning and care for these sections while it sets to do its work is an important step in our service and one you can depend on our experts to carry through on effectively. We aim to bring you a service that’s as unobtrusive as possible while still ensuring that you have the results you’re looking for. When choosing our professionals for your stained concrete patio and otherwise, you can depend on us to handle every stage in confidence. When the right steps are followed, the setting is finished, and the surface is cleaned and set, the final step is bringing you the sealing you need to lock in the aesthetic charm of your newly stained floors and surfaces. We use only the highest quality products with a lifetime of proven efficacy in order to ensure that you get a result you can depend on for a lifetime. If you’ve been curious about this particular finish, knowing that you have a local concrete company ready to bring you results is the goal of Richmond Stamped Concrete.